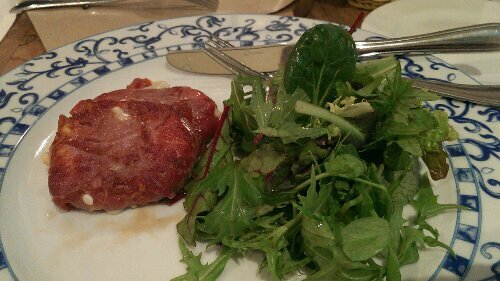 Pietrasanta @Portsdown Road (Singapore) | Get Your Grub On! A colleague friend came into town on a transit to the Philippines and so we rallied the troops and all went together to ‘Pietrasanta’ in one of the black & white houses down at Portsdown Road. We were warmly welcomed by the friendly staff and the manager and seated on a big table inside. 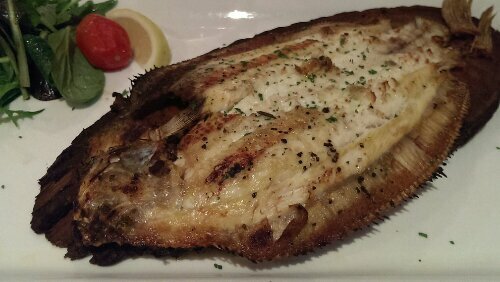 As my main I chose the fish special ‘Grilled Sole‘ which I saw floating by to another table earlier. The fish was huge and looked super tasty with it’s nice chars from the grill. Following the managers recommendation I drizzled some of their fancy olive oil on top and together with the lemon and the pepper it tasted absolutely great. The kicker on this was that after it came from the grill they put the sole on a wooden board coming from an olive tree so when turning the fish over, the second half offered a completely new flavor, smokey and with an oaky taste to it. Very happy that I sighted this. Before this lovely fish we shared a variation of antipasti like the ‘Scamorza con Prosciutto‘. The cheese was lovely smokey and melted but still firm and wrapped in a salty cover of crispy pan fried parma ham. 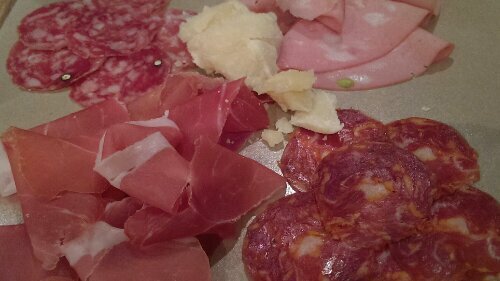 We couldn’t get enough of the ‘Tagliere Di Salumi e Formaggi‘ which was a cold cut platter of delicious parma ham, juicy and light mortadella, two types of salty and nutty salami and a centerpiece of parmesan that tasted lovely milky. 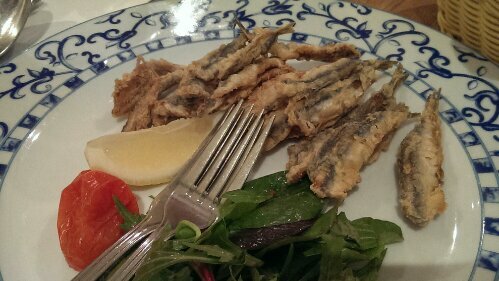 Another starter we ordered was the ‘Acciughe Fresche Fritte‘ which were freshly imported anchovies fried in a light batter. Other than usual the tiny fishes were properly cleaned and only fried for a very short time so they were still moist and tasted like eating them in Italy. Last but not least we had the famous ‘Burrata‘ a huge deformed mozzarella cheese ball filled with a mixture of the same as well as heavy cream. 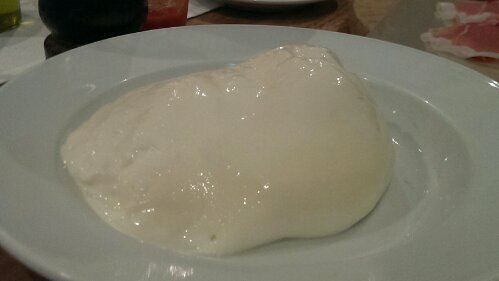 I loved the outer shell of this as it had a weird yet nice texture and tasted like strong milky white blob. The others preferred the inner core which I found too creamy to eat too much of it. The burrata was accompanied by an extra plate of juicy tomatos, arugula and parma ham which in combination with the nice olive oil made this a brilliant appetizer. 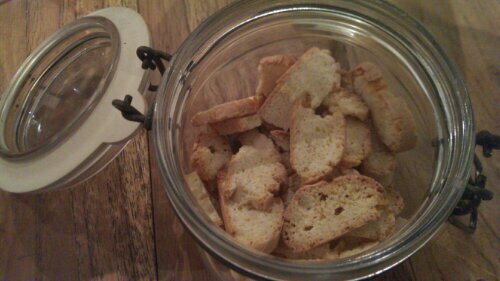 During the entire dinner we were exceptionally well taken care of by our head waiter and all the other staff and after we had finished everything we received a digestive including a freeflow of freshly baked biscotti and chocolate covered roasted almonds. I had been here before but didn’t remember it being this nice. The food was fantastic and proper down to earth home cooked Tuscan cuisine and the service was memorable friendly and attentive. A great piece of Italy in traditional Singaporean heritage.